Paint Hooks, racks, fixtures. Automotive Parts. Powder Coated Parts. Strip plastic, rubber, varnish, paint, powder coating, grease, gaskets, clutch liners, brake pads, from metal parts. 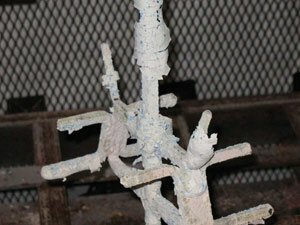 ACE Equipment Company provides Metal Parts Cleaning services that will strip coatings from metal without damaging the part. ACE manufactures Burn Off Ovens that are very precisely temperature controlled so that many types of parts can be cleaned. Aluminum, thin sheet steel, carbon steel, etc. Large volume ovens with capacity to clean your metal parts. Optional: Ash removal with high-pressure wash and rust inhibitor service. Welding repair, paint and powder coating available as well. 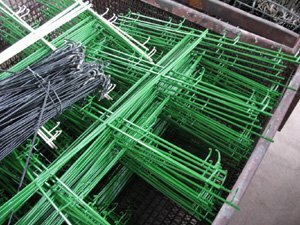 Powder Coating System racks, hooks, fixtures, load bars, etc. 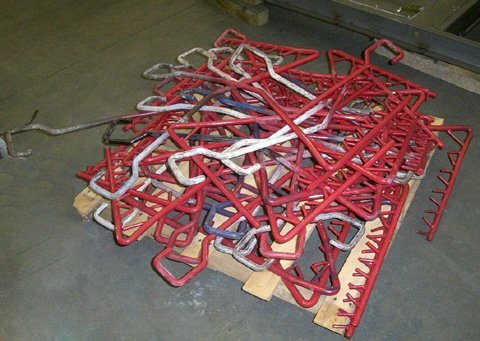 Close up of Powder Coating Rack immediately after cleaning. A load of Paint Racks ready for cleaning in the Burn Off Ovens system.